Looking for a brunch dish with a difference? 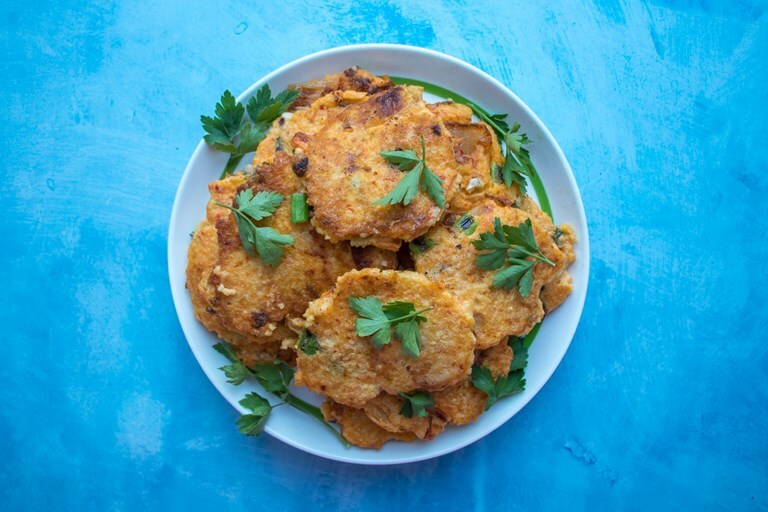 This kimchi and millet pancake recipe combines the funky, umami-rich and sour flavours of Korean kimchi with millet, a gluten-free grain that's beloved for its bouncy texture. Be sure to check the ingredients list of your kimchi to see whether it contains fish sauce if serving to vegetarians. Millet? Millet! An ancient and very delicious grain that is overlooked in our wheat-dominated culinary society. It is a small seeded grass, common in many parts of the world, most notably India and parts of Africa. It is easy enough to source in health food shops and online. Most commonly here you will find it as pearl millet or flour, and it makes an excellent substitute when baking bread. Millet is a superb ingredient for those on gluten-free diets (or just generally) and is a rich source of protein, dietary fibre, several B vitamins and numerous dietary minerals. There is much you can do with it. Millet is eaten as porridge in Russia, is commonly used in bread-making (and is used to make roti in parts of India) and is used to make awaokoshi (candied millet puffs) in Osaka, Japan. Millet is a staple in parts of Africa and is used to make hausa koko, a soured and spicy smooth porridge in West Africa. Millet is a small, tense cereal, in that I mean it tastes like it has a little bounce. It cooks very quickly and is not strongly flavoured and so it pairs well with big flavours like kimchi, and it makes a great cheesy pancake too. Go for broke and make a Korean 'kimcheese' millet pancake by adding fifty grams of grated cheese to the recipe below! It makes a great substitute for recipes that require couscous or bulgar wheat too. Pearl millet is superb in these pancakes. The outside gets nice and crunchy and the inside is tender and rich with kimchi. In terms of starch, I love to use potato starch (easily found in Asian food shops). Potato starch has a stretch to it and gives a nice chew. Cornflour will work well too, but you will miss that stretch. The only thing to watch out for is if you have thyroid problems. Millet is goitrogenic and can be a problem here.